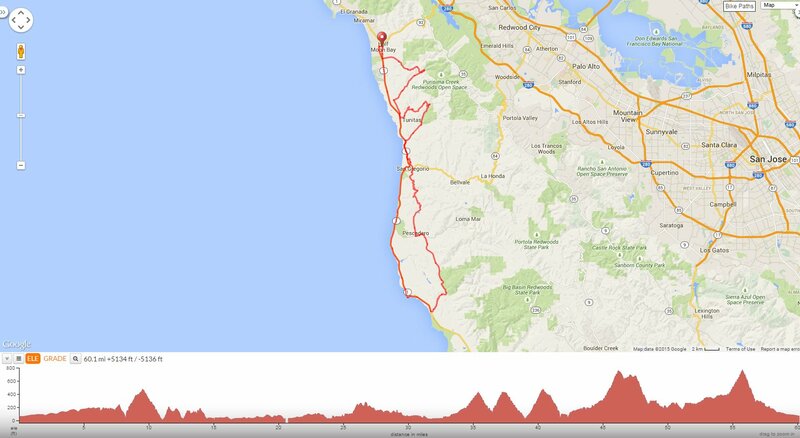 Take Kelly Ave to CA-1 and head south along the coast for the next 20.3 miles to Pigeon Point Rd. CA-1 S leads out of town pass the local ball field, restaurants, horse ranches and golf courses. The turn on Pescadero Creek Rd leads to the small coastal town of Pescadero. The descent on CA-1 N leads to the turn onto Tunitas Creek Rd for a stop at the Red Bike Hut. The gentle rolling terrain along lower Tunitas Creek leads to the climb up Lobitos Creek Rd. Half Moon Bay-Main St to Kelly St.